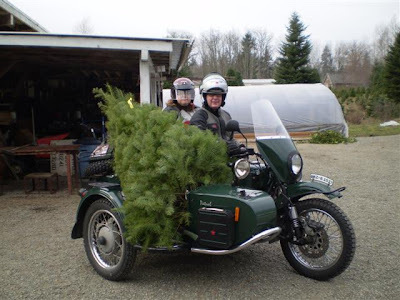 And here I thought I'd done something last year when I transported a 7 foot Christmas tree home inside our Honda Fit, but Barry a/k/a "Windmill" from ADVrider put me to shame when he and his wife recently rode their Ural side-hack rig to a tree farm near their home in Kent, Washington. Thanks Fuzzy One and Stacy. Any other readers have any cool pics of trees on bikes?